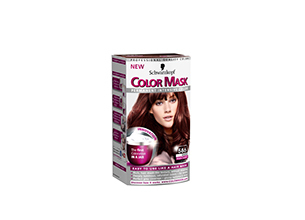 Schwarzkopf transforms dull hair into shiny, head-turning locks with the revolutionary new Color Mask – the first hair mask colourant with threefold, indulgent care for intense, lustrous shine and long-lasting colour. Availability: Exclusive to Clicks stores nationwide. I’ve been dyeing my own hair for almost seven years now, and for six of those, I’ve been using the same hair dye (granted, in different shades). Why try fix something if it’s broken, right? So as a result it never occurred to me to try a new product. The reason I was so willing to try this hair dye, is because it has one property that makes it unique: it is the first ever hair colour that comes in the form of a hair mask, that nourishes the hair while it colours it. Anyone who colours their hair knows about the damage that follows, so a product that promises to nurture the hair in the colouring process is sure to get attention. I bravely opted for the shade Warm Mahogany (a richer red than my usual shade of auburn), and began the process. My first impression was that the formula had an incredibly strong chemical smell, so it’s best to keep the windows open whilst applying it. The instructions were simple and easy to follow, and I found the product spread easily and evenly throughout my hair. A word of warning though – if you have long hair, buy two boxes. My hair hangs halfway down my back, and I ran out of product before I reached my ends, so it took a bit of spreading and rubbing to ensure that the colour reached everywhere it needed to. A major plus is that the colour did not stain my skin, in fact, the patches I had on my forehead, ears and neck easily came off with a bit of soap and warm water. After rinsing the colour and applying the conditioning mask, I dried my hair and gently combed through it. The result? My hair was super shiny, in fact, more shiny than it has been in a long time. The colour was rich and true, and so far, hasn’t faded. But most importantly, my hair felt nourished after I used this dye. Even my slightly-overdue-for-a-trim ends felt (and continue to feel) soft. I was extremely impressed with the results and will definitely use it again in the future. atfer 30 minutes, it did make a different to the colour of my hair, unlike, Clairol chestnut brown which i previously tried and couldnt notice a different in my hair colour, again this could be due to the color of my natural hair, im not an expert. the texture of my hair afterwards, was so lovely and shiny and luxurious that I would want to use this mask atleast once a month. i love the effect it has on my curly bushy hair, my curls tamed down without loosing definition. Until then, anybody that wants to colour hair at home, dont settle for cheap products that claim to be quick and easy. use Schwarzkopf, its easy to apply, leaves your hair looking luxurious. What more could a girl want? I love this product. It is easy to apply, no mess no fuss. I love the smell and the richness of the colour afterwards is amazing, with lots of shine!